"What did happen on the Cahulawassee River?" Life will never be the same for people along the Cahulawassee River valley in Northern Georgia. After the building of a new dam, water floods a vast area of land in the vicinity. Four Atlanta city slickers with entirely different personalities take a canoe trip together on the river. Alpha male Lewis Madlock and the most stable one of the group (Ed Gentry) are the only two of the group who know anything about the outdoors. Therefore, this trip becomes quite the adventure-more so than the four bargained for. During the water expedition, Bobby Trippe makes sure he gets in his jabs, and gullible Drew Ballinger just goes along with it all. It’s a miracle if they make it to the other side alive at one point, and each challenge results in increasing conflict among the four. Both lives and relationships are threatened while these men attempt to enjoy the wilderness without their wives, children, homes, or golf clubs. The “fun,” or rather lack thereof continues as the group seems to confront more danger. Trouble also arises, and at one point a suspicious sheriff becomes involved. Along the way, they contend with unfriendly locals, creepy rednecks, friendly “fire,” and natural disaster. What will become of them? Will they make it home alive? The fate of four average suburban men will soon be decided-all because of one weekend they spend away from home. Was it really worth it to them? Did they at least learn anything from this short vacation? Deciding not to play golf may have been either the best or worst choice of their lives. Shotguns are fired, and paranoia-inducing nature noises causes panic before the natural finish line is reached. Perhaps nobody wins in this race, although everyone tries their hardest. It is soon evident that this trip will challenge the notion that they will return home to their comfortable beds like planned. Unexpected turns and increasing intensities of tragedy continue to meet the four men as they navigate clumsily down the river. The harsh waters beating against the rocks even rip the canoe in half and the men who once felt in control of their lives are thrust against the current. Will this local body of water washed them away for good? They hope with every last breath to make it to dry land. However, even if they do, their outlook on life more than likely will have changed. 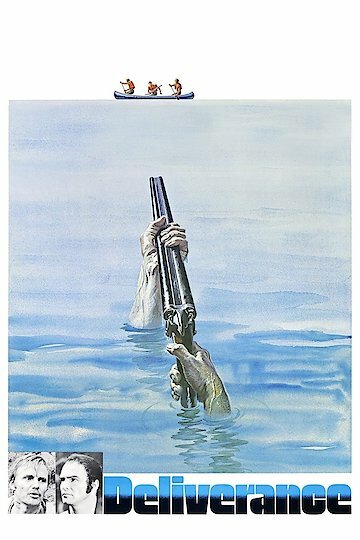 Deliverance is currently available to watch and stream, download, buy on demand at Netflix, Amazon, Vudu, Google Play, iTunes, YouTube VOD online.